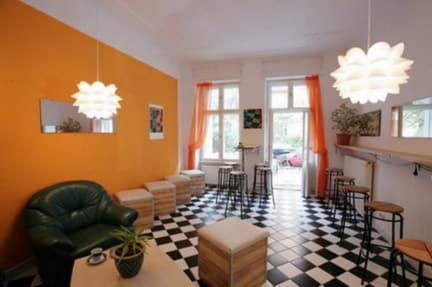 BackpackerBerlin i Berlin, Tyskland: Bestill nå! Experience Berlin's nightlife in its hippest district - Friedrichshain. We are happy to invite you to enjoy new and old stores, appetizing restaurants, cute bars and cafes in a young and fresh neighborhood , where the city meets to go out. Explore the unique Berlin lifestyle while sightseeing,exploring, clubbing or just relaxing. 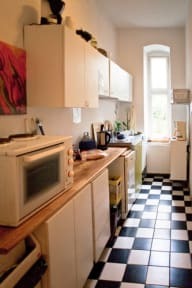 We are a cozy little place, where the guests are not just a number, but feel more like being in a big shared flat! Our receptionists will help you find things off-side the mainstream and take their time to respond to your needs. To make your check in as comfortable as possible , please be aware that our reception is open 8-am to 12pm, but once checked in we have no curfew! Write us directly if you need any info :).